Lifestyle Daily - Could a Stairlift Help Your Aging Parents Stay in Your Childhood Home? Your parent’s house is where you grew up, where countless comforting meals came out of the kitchen and you relaxed on the couch after a long day at school. This is the place where you made some of your most precious childhood memories. It’s also where your parents have invested their time and energy for years. As you grew up and moved on, your parents stayed. This old house, with its stairs and plentiful rooms that used to contain the whole family, is now becoming too big for your aging parents. Once they can't climb stairs safely, however, many seniors think that their only option is to downsize to a one-story home to maintain their independence. However, it’s still possible to live in a two-story home as an aging adult with the right preparation. Staying in a home is easier when you cut down on clutter and simplify furniture arrangements, which make cleaning less cumbersome and time-consuming. Guard rails and ramps can also be installed to make areas of the home easier to access. Another useful product that can help your parents stay mobile around a multi-leveled home is a stairlift. Stairlifts are installed next to any set of stairs in the home. When activated, they can carry your loved ones between floors on demand. 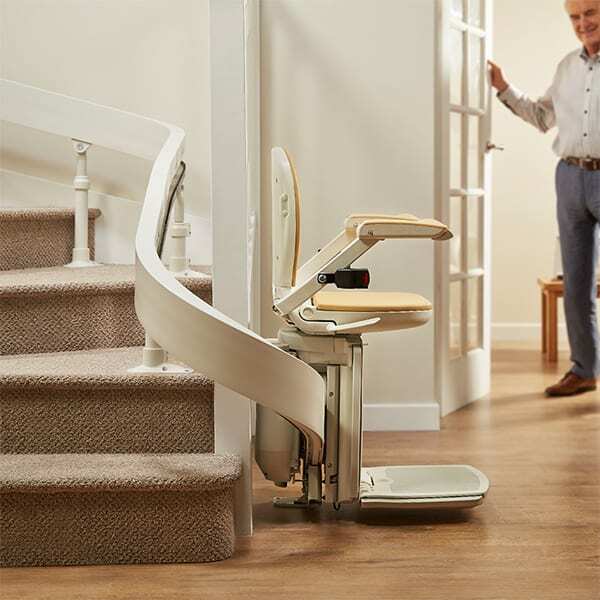 Here are some of the benefits of installing a stairlift in the home. Avoid the costs of buying a new house, which include closing costs, down payments, repairs, and more. There’s no need to sell their current home – a process that can include costly renovations, intrusive showings, and complex real estate negotiations. Eliminate the hassle of moving and relocating, which involve many tedious tasks like selling furniture, paying for movers, and boxing up treasured possessions. Keep your loved ones independent for as long as possible by allowing them to move freely from floor to floor. Help prevent your parents from falling down the stairs. As people age, their coordination and balance decrease. Climbing the stairs takes strength and balance to do correctly and safely. Stairlifts eliminate the possible hazard of falling down the stairs, keeping your parents safe. From increased safety to lower stress – when you consider all the benefits of keeping your parents in their original home, a stairlift is a great investment for everyone’s happiness.